I was waiting on the Furniture Bank truck to pick a donation, and so was keeping a sharp eye out the front window. 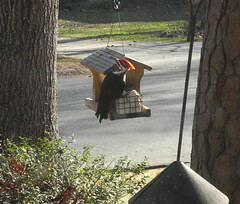 That gave me a great view when I had a very suprising visitor to my birdfeeder: a pileated woodpecker. They are such awesome birds, and I haven't seen one in the area in over 10 years--I used to see a pair occasionally not long after I bought this house, but they then quit coming around. Those would be spotted across the street and high up on the big pines, too, not trying to grab a suet snack off a feeder designed for birds a third the size. The pileated woodpecker left, and I then had visits from my usual woodpeckers, red-bellied and downy, amid the many of bluebirds, nuthatches, sparrows, little yellow birds I can't identify, a blue jay (also too big for the feeder, but nothing like the pileated), and others. Didn't see any cardinals today, but there are usually some around. 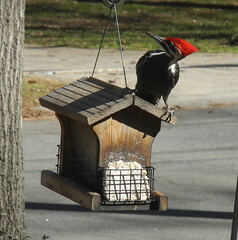 The pileated re-appeared in the afternoon and perched on my big pine, then went back and forth to the feeder a few times. That gave me a chance to get a good pic of the Woody Woodpecker crest. So cool! I hope it (she, I think) stays around. What a nice bird to have at your feeder! Two options for little yellow birds at a feeder in Georgia at this time of year would be goldfinch and Pine Warbler. If you can get a picture of one, I can try to identify it for you.